ANS in French, signed “Renoir,” one page on a 4 x 2.75 card, no date. 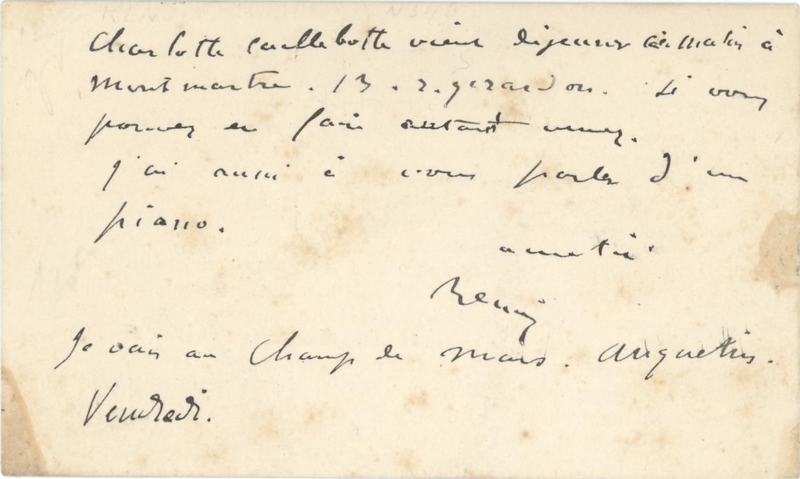 Note to Charlotte Caillebotte talking about be able to meet and about her Piano. This is a very interesting letter since it refers to a piano. Renoir is known for his many paintings with the use of Piano's was known as a good friend of Charlotte Caillebotte. Charlotte was never maried but lived with Gustave Caillebotte. Caillebotte was a French painter, member and patron of the artists known as Impressionists, he helped fund Impressionist exhibitions and support his fellow artists and friends (including Claude Monet, Auguste Renoir, and Camille Pissarro among others) by purchasing their works and, at least in the case of Monet, paying the rent for their studios. note card has some toning and scattered soiling, otherwise fine condition.